In the beginning there were only natural dyes. A natural dye is any dye that is derived from nature through organic and inorganic materials and/or sources. Weavers have used these dyes exclusively for thousands of years and artists have employed these pigments from pre-history through the 1850’s and 60’s. Before 1865 nobody would ever have asked what kind of dyes were in a particular Oriental rug. That’s because there were only natural dyes – colors made from plants or, occasionally, from insects. Nor would anyone ask if the yarn was hand spun – there was no other kind. It turns out all of the great, valuable antique rugs all have one thing in common: natural, vegetal dyes. The effect of the Industrial Revolution on Oriental rugs was the invention of synthetic dyes and machines to card and spin wool. Chemical-dyeing and machine-spinning almost entirely replaced the older methods by the 1920’s and creativity in Oriental rug weaving was in total decline. Carding and spinning wool by machine produced uniformly shaped wool that would take a solid, static color. The use of chemical dyes ensured that the color would always be the same. Red dye #3 always looks like red dye #3. Early chemical dyes such as aniline dyes were so bad they nearly ruined the Oriental rug industry. Many early synthetic dyes bled, damaged the wool, faded and changed color over time. By the 1970’s the use of natural dyes in carpets was almost a lost art. Natural dyes are organic, vibrant and alive while synthetics are inorganic, flat, and dead. Most modern clothing is dyed with synthetic dyes and when one looks at them their palette is flat and unchanging. Natural dyes have tonality, luminescence and depth. When combined with wool that has been processed by hand, with old fashioned tools, the carpet becomes almost becomes three dimensional. This is because every piece of hand spun wool is a different size and shape. Each one absorbs the vegetal dye a little differently producing a variegated palette with a shimmering quality called abrash. The effect of this pleasing irregularity of color is a rug that is vibrant and full of life, and character, with a visual texture that does not tire the eye. Natural dyes develop a patina and mellow over time like a favorite pair of blue jeans. The colour itself will not change completely over time but rather become a softer, muted version of the same colour. Synthetics never improve with age and the expression that comes to mind is “Fleeting as an aniline dye”. Natural dyes are kind to wool. For example, indigo actually coats the wool fiber. 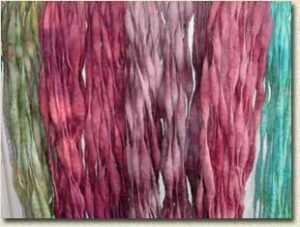 Synthetic dyes usually require bleaches and actually strip the lanolin from the wool. Natural dyes are organic and alive and the human eye responds to the subtlety and nuances. The result is that a carpet created with natural dyes ages gracefully and becomes an antique of the future. The 1980’s saw the arrival of a renaissance in the Oriental rug industry as a small group of “neo-pioneers” sought to revive the use of handspun wool and natural dyes. Efforts were made to find the elders who still had the knowledge and recipes for natural dyes in their heads. The result is that today you can have a decorate your home with a beautiful natural dye rug as good as any priceless antique. So in the end are natural dyes better than synthetic dyes? Today’s modern dyes are mordanted with potassium bichromate and are thus known as chrome dyes. They have been in use for over sixty years and are a huge improvement to the synthetic dyes of the late 19th to the mid 20th century. The choices are strictly aesthetic now. If one likes the pleasant irregularities of tribal rugs then they might prefer the variegated look of rugs made with handspun wool and natural dyes. If one likes a more formal or what is referred to as city carpets, with elaborate and intricate curved designs they might prefer the preciseness of machine spun wool and chrome dyes. One thing to consider is if you might want to sell your rug in the future. Here at Harry King we are happy to take any hand knotted wool rug in for trade, but we only buy used rugs if they are made with natural dyes and hand spun wool.